It's bitterly cold outside and I hope I'm forgiven with posting a more beauty related post. 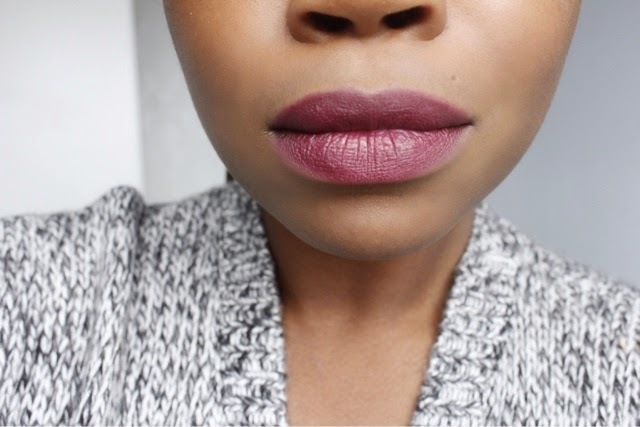 Today I'm coming to you with a lipstick review / comparison of MACS' oh so popular Rebel Lipstick and...Topshops' Matte Lip Bullet in 'Get Me Bodied'. 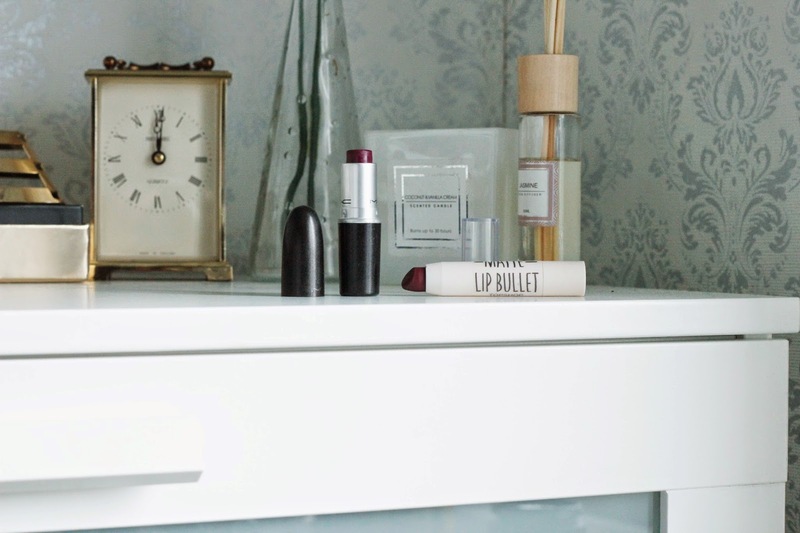 I haven't really used any Topshop beauty goodies as of yet, considering their large range and availability, don't know I just never got around to sampling one of their lipsticks or blushes. So when I received the lip bullet in 'Get Me Bodied' as part of my Secret Santa by the lovely Kayleigh I couldn't thank her enough. 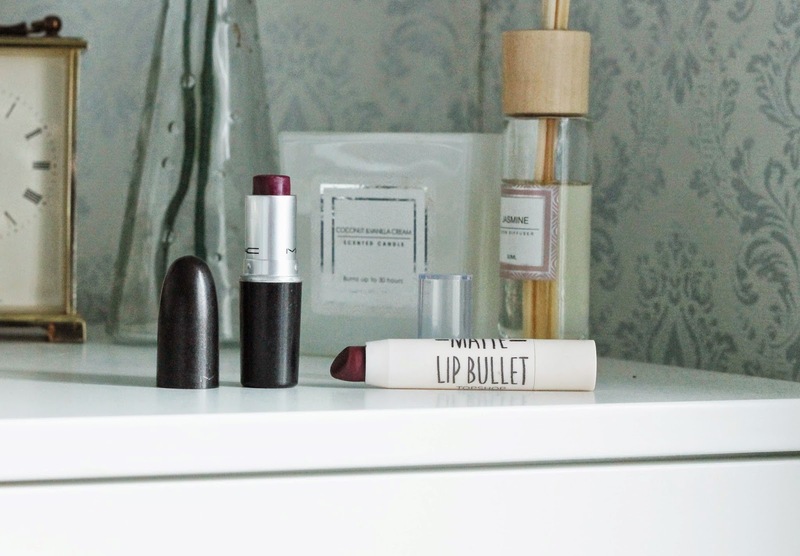 I think everyone in the office knows that I have a penchant for burgundy/ dark lipsticks. Forget nudes, a vampy burgundy lip is my go-to on a daily basis. At first glance Rebel appears more berry and more vibrant than Get Me Bodied. 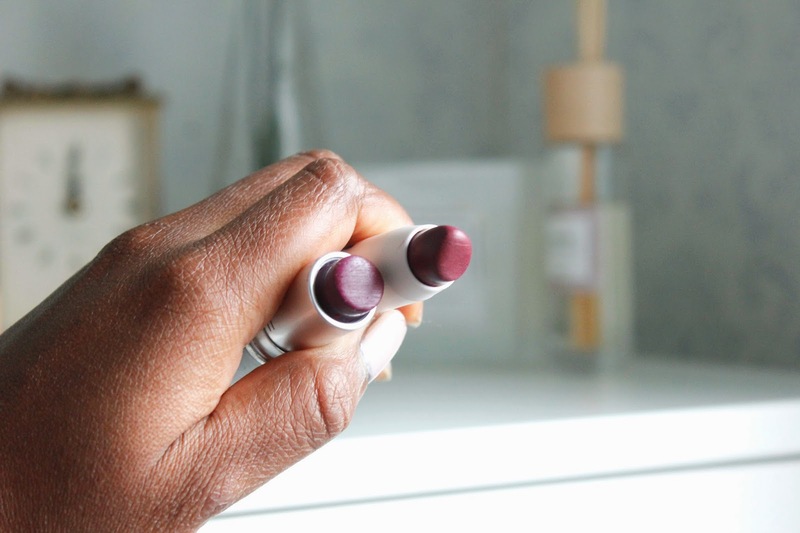 Both lipsticks are great for darker skin as they are both very pigmented and apply like a dream. Though, Get Me Bodied had a slight advantage with a better grip. Next, it was swatching time and as mentioned before both were applied with ease and no hassle. MACS' Rebel has a lot more violet/berry tones giving it an overall more burgundy appearance. TS's Lip Bullet in 'Get Me Bodied' in comparison is a lot 'cooler' with blue undertones appearing a lot more understated. 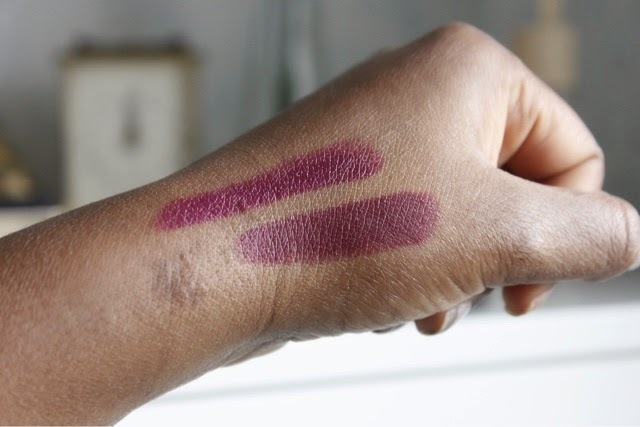 MACS' deeper berry shade is quite evident when swtached next to each other. 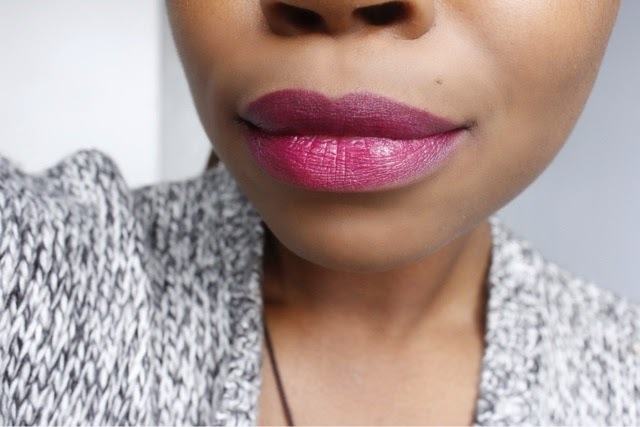 lightweight - one of the reasons why I wanted to review this lipstick tbh. You can barely feel it on your lips! packaging- I'm loving the design and the retractable twister, much like a lip crayon. The only minus is the lid, it does tend to fly off at times and disappear into the abyss that is my handbag! the shade is PERFECT for darker skin tones especially. I'm quite certain all my friends regardless of skin tone have this gem in their handbag, it looks different on each one of them - making it very universal. Everyone can wear this shade! As a whole, if you haven't go the budget but would still like to get a nice dark berry lipstick I would definitely recommended TS Get Me Bodied- dabbing a bit of red lipstick on top of it would get you a near perfect shade match to MACs' Rebel. Seeing that I have both I'll probably use Get Me Bodied on a more day to day basis and opt for Rebel for a wow factor when going out! What do you guys think about Topshop Beauty Items? 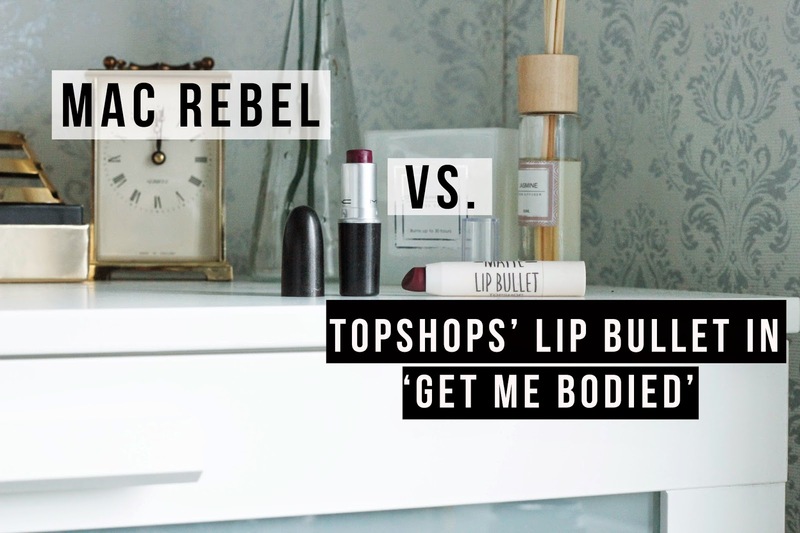 Any Topshop Beauty faves or have you found your Rebel Dupe?